Dysarthria is a motor speech disorder which typically results in poor articulation of phonemes, the muscles which help in producing speech. 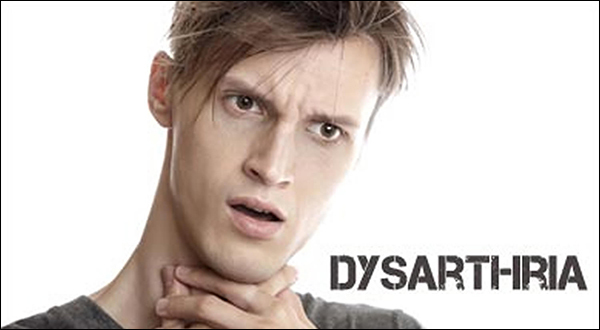 Other than poor articulation, Dysarthria is also characterized by problems in any one of the other speech subsystems --- including respiration, resonance (for speech sounds), prosody (emphasis and inflection), and phonation (control of vocal folds for appropriate voice quality). Dysarthria is a speech disorder which is the outcome of a neurological injury because of some damage in the central or peripheral nervous system. The injury can lead to the disorder because it can weaken or paralyse the motor-speech system, or affect the overall coordination of the system. As a result, the affected individuals may lose control over the tongue, throat, lips or lungs, and may even experience difficulties in swallowing. People affected by Dysarthria usually have a slow, slurred, and effortful speech because they have difficulty in pronouncing words. Although Dysarthria is not related to problems with understanding a language, it can lead to impairments in intelligibility, audibility, and efficiency of vocal communication. The progression of Dysarthria can potentially put an affected person at the risk of a total loss of speech (a condition known as 'Anarthria'). Dysarthria can cause communication problems which can, in turn, result in some complications for the sufferers. These complications may include Social difficulty (affecting the sufferers relationships with family and friends), and Depression or stress due to social isolation. Degenerative diseases, including Parkinson’s, Amyotrophic Lateral Sclerosis (ALS), Multiple Sclerosis, Huntington’s disease, Niemann-Pick disease, and Friedreich ataxia. Toxic and metabolic conditions, including Wilson's disease, Central Pontine Myelinolysis, and Hypoxic Encephalopathy (like in drowning). In addition to the above causes, some other reasons behind the occurrence of Dysarthria may include conditions such as Cerebral palsy, Guillain–Barré syndrome, Hypothermia, Lyme disease, Intracranial hypertension, and Tay-Sachs (and also late onset Tay-Sachs, LOTS) disease. Difficulty in moving tongue or facial muscles. The treatment of Dysarthria basically involves the use of several diverse techniques by speech language pathologists, for managing the articulation problems which result from the disorder. These techniques may vary from person to person, in accordance with the effects of the speech disorder on the control of the articulators. Generally, the conventional methods of treatment of Dysarthria are aimed at correcting the shortfalls in rate of articulation, intensity/loudness of voice, resonance for speech sounds, prosody (proper emphasis and inflection), and phonation (control of vocal folds for appropriate voice quality). The techniques for treating Dysarthria chiefly involve certain exercises to strengthen the articulator muscles and enable the patients to gain control the over these muscles. For managing Dysarthria in a safe and natural manner, some useful herbal formulations are available from Planet Ayurveda herbal manufacturing company. These products are prepared under the supervision of renowned Ayurveda experts, and from the use of 100% pure herbs. The widely-known ‘Brahmi’ herb (Bacopa Monneiri) has immense therapeutic value and is rich in antioxidants which are beneficial for a healthy living. The herb is considered to be a remarkable health tonic, aphrodisiac and memory enhancer. For the preparation of these capsules, the standardized extract of 'Brahmi' herb are used. The capsules can be useful for Dysarthria patients because of their proven ability to promote mental health, re-build brain tissues, boost the immune system, regulate blood pressure, reduce stress/anxiety, relieve inflammatory conditions, and eliminate free radicals from the body. Dosage: 1-2 capsules two times a day, with plain water, after meals. The ‘Ashwagandha’ herb (Withania somnifera) is widely used in Ayurvedic preparations because of its beneficial anti-inflammatory properties, and the capability to promote overall good health. To prepare these capsules, pure and natural extract of 'Ashwagandha' herb are used. The capsules are recommended for people affected with Dysarthria because their use can enhance mental and physical capabilities, keep the immune system healthy, remove toxins from the body, improve the functioning of circulatory system, reduce metabolic imbalances, reduce hypertension, improve the functioning of the brain, reduce the levels of 'cortisol' (stress hormone), and pacify the body's 'Vata' and 'Pitta' doshas. Dosage: 1-2 capsule two times a day, with plain water, after meals. This herbal powder, chiefly used as a nerve tonic, is prepared from a number of herbs which are useful for improvement of memory, concentration and stress relief. The herbal components of the herbal powder include: Vacha (Acorus calamus), Ashwagandha (Withania somnifera), Sonth (Zingiber officinalis), Pippali (Piper longum), Maricha (Piper nigrum), Brahmi (Bacopa Monneiri), Shankhpushpi (Convolvulus pluricaulis), Ajmoda (Carum roxburghianum), Shwet Jeerak (Cuminum cyminum), and Krishna Jeerak (Carum carvi). Medhya churna is considered a natural brain supplement for memory enhancement. The use of the churna is beneficial for Dysarthria patients because it can improve concentration span, relieve speech-related disorders, improve speaking abilities, reduce anxiety, relieve stress, boost the body's immune mechanism, detoxify the body, rejuvenate the nervous system, and balances the 'Vata', 'Pitta' and 'Kapha' energies of the body. Dosage/Usage: A pinch of Medhya churna should be rubbed on the tongue, 3-4 times a day. 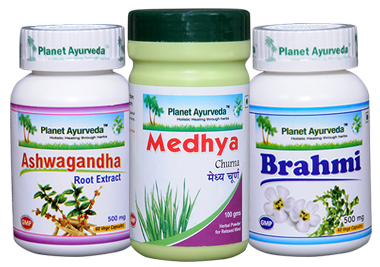 The patients of Dysarthria can benefit from the use of Planet Ayurveda's herbal products because of the presence of natural ingredients which have been used by Ayurveda experts since ages. The products are safe to use because they are completely vegetarian formulations which do not conation any chemicals, colours, starch, yeast, preservatives, additives, binders or fillers.